You’ll be redirected to PayPal.com when you submit. Thank you for all you do as a Parks Conservancy member! Today, we need your help to clean our beaches, remove invasive plants, restore trails, plant wildflowers. Your additional gift makes it possible to support tens of thousands volunteers doing this important work in our parks. We’ll gratefully put your gift of any amount to use right away. If you are able to donate $125 or more, we’ll send you an exclusive members-only bag. Will you consider changing your donation to a monthly gift? Your monthly “Golden Gate Keeper” donation will help us to protect wildlife and ecosystems, preserve recreational opportunities, and introduce young people to nature. No thanks, please process my single gift. You are able to change or cancel your monthly gift at any time. No Special Gift Select this option if you would like your entire contribution to go to the parks. 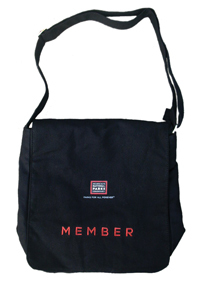 Canvas Member Bag Perfect for all your parks excursions! There is no special gift available for the selected level. Giving an amount that is at least as large as a fixed gift amount entitles you to any corresponding gift(s). Yes, I would like to receive e-mail from the Parks Conservancy. What is the Verification Code and what does it look like? For your protection, we ask that you enter an extra 3-4 digit number called the CVV2. The CVV2 is NOT your PIN number. It is an extra ID printed on your Visa, MasterCard, Discover, or American Express card. On the back of the card in the top-right corner of the signature box, as depicted in the image to the right. Enter the three-digit number following the credit card number. On the front of the card as depicted in the image to the right. Enter the four-digit number on the right directly above the credit card number. Paying by PayPal is not currently available for monthly recurring donations. To set up a monthly donation, please pay using a card. We apologize for any inconvenience. Thank you for donating! To donate by phone, please call (415) 561‑3060.